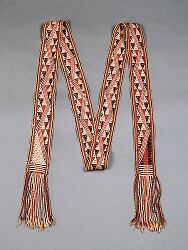 Belt, Pima. 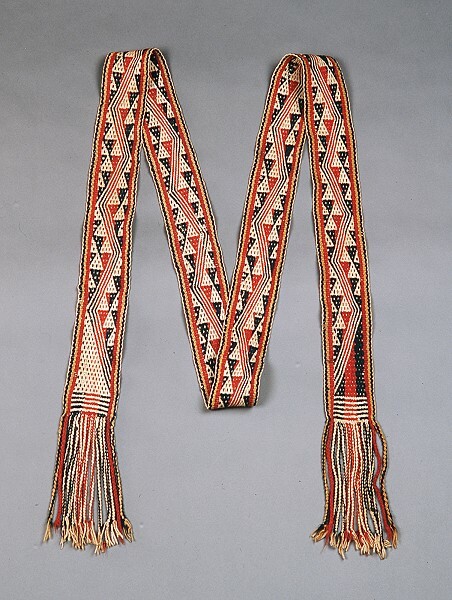 Collected by John Russell Bartlett in Arizona, ca. 1850. Department of Anthropology, National Museum of Natural History, Smithsonian Institution, cat. no. E178911, acc. no. 00019931. Dimensions: 80 in. without fringe, 92 in. with fringe (warp) x 2.25 in. (weft). Thread count: Warp = 49/in. ; Weft = 9/in. Fibers: Warp = 2-ply cotton thread, natural white, S-spin, Z-twist; 1-ply handspun wool yarn, vegetal-dyed yellow, Z-spin; 2-ply handspun wool yarn, vegetal-dyed blue and red, S-spin, S-twist. Weft = 2-ply cotton thread, natural white, S-spin, Z-twist. Design: End panels consist of white stripes (four on one end, five on the other). The main panel has three parallel white zigzag lines through the center flanked by dotted white, blue, and red triangles and framed by red, yellow, and blue stripes.